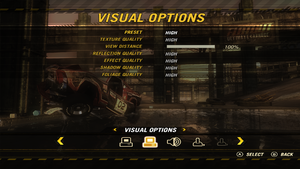 Enhanced port of FlatOut 2, featuring new gameplay modes and graphics as well as four new drivers and at least two new cars. 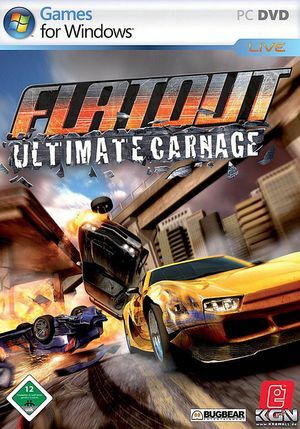 Can only be used in single player. While FOV and in-game HUD are correct, menus are stretched. Use ThirteenAG's fix to fix stretching. Requires disabling GFWL. Free camera control is not available on the PC version. Xbox prompts even when using the keyboard. Retail only. The language files are available. Does not apply to Windows 10. Use either 50Hz or 100Hz if your monitor is capable. If using G-Sync/FreeSync, use a third-party tool to cap the frame rate at 50 fps or leave it uncapped for 100 fps. 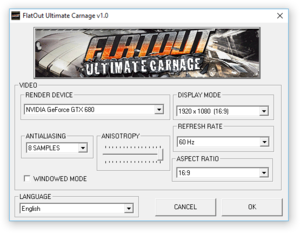 Only leave it uncapped if your PC is capable of delivering 100 fps consistently. Integrated graphics cards aren't officially supported. ↑ 2.0 2.1 File/folder structure within this directory reflects the path(s) listed for Windows and/or Steam game data (use Wine regedit to access Windows registry paths). Games with Steam Cloud support may store data in ~/.steam/steam/userdata/<user-id>/12360/ in addition to or instead of this directory. The app ID (12360) may differ in some cases. Treat backslashes as forward slashes. See the glossary page for details. This page was last edited on 11 April 2019, at 21:34.